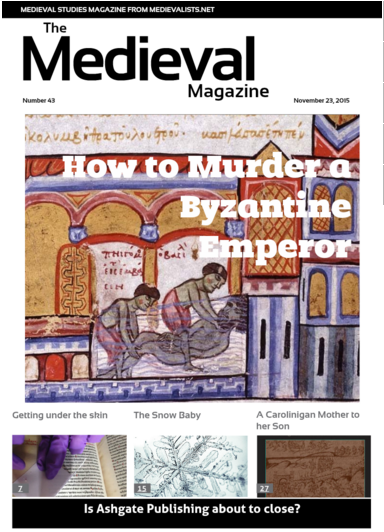 In this week’s issue you can read about Byzantine Emperors, Anglo-Saxon England, Fabliaux, medieval manuscripts and what advice a mother gave to her son in the 9th century. An empire like Byzantium does not last for a thousand years without its own share of political intrigue. Many of its emperors would not go on to live full lives, for their position was often under threat by both external enemies and internal rivals. While an unlucky Byzantine emperor who found himself usurped could be exiled to a monastery (sometimes after being blinded or castrated), there are a handful of episodes where Byzantine emperors were murdered. Here are three accounts told by medieval chroniclers in vivid detail, in which the plot did not go as smoothly as the conspirators hoped, but in end resulted with a new man on the throne.